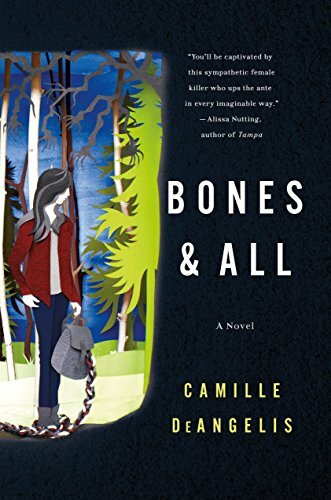 Upon first reflection, Bones & All by Camille DeAngelis could best be described as quirky. The premise: a sixteen-year-old girl eats people. She’s done this all her life. How does she choose who she eats? The smell upon a person’s breath sets the activity in motion, and she is unable to stop herself. Only one female— her first victim; the rest were males who tried to be her “friend.” And so she showed them what friendship with her was all about. Maren Yearly’s mother, Janelle, is fully aware of her daughter’s actions, and with every bite she moves herself and Maren to a new location. Upon Maren’s 16th birthday, her mother, unable to endure any more, abandons her. Maren travels to her grandparents’ home and discovers her mother living there. Unable to face her mother, she turns and leaves, determined to find the father she never knew. Her travels in search of her father take her into the realm of a variety of acquaintances upon whom she dines. At the same time she encounters others who enjoy the same pastime she enjoys—dining on others. In particular, she comes into contact with Sullivan “Sully” and Lee, each of who teach her some of the finer points of living outside of the norm. Maren’s discovery of her father’s whereabouts and fate prove disappointing, but not unexpected and yet another reason for Maren to remain apart from others. Life with Lee and Sully takes a variety of turns for the reader, and yet not entirely unexpected considering the life she leads. Like many serial killers in fiction . . . if not in real life . . . Maren collects keepsakes from her victims, often books that play an important role as a coping mechanism. On the whole, it is difficult to be sympathetic toward a serial killer, and yet there is something in DeAngelis’s characterization of Maren that, if not endears the reader to Maren, at least presents her as sensitive; one whose life is not in her control. Dinners for Maren and those like-forces she hooks up with are somewhat difficult to picture, and harder to believe, since absolutely nothing of the bodies is left behind—hence the title, Bones and All. Maren justifies her actions with, “It was like leading me to a banquet and telling me not to eat.” Gratefully, there are no blood-and-guts scenes, just the awareness of what has happened. DeAngelis’s voice and writing style are clear. Her description of characters and setting provide the reader with a good picture of surroundings and the people that occupy those locations. She remains inside Maren’s head through the entire story, allowing the reader to deeply experience what her main character is feeling. While the topic of cannibalism cannot exactly be categorized as enjoyable, DeAngelis’s ability to tell an engaging story that draws the reader in makes this quirky read a real page-turner.